XL Dynamics Recruitment Drive For Freshers On 5th July 2016 - Mumbai. 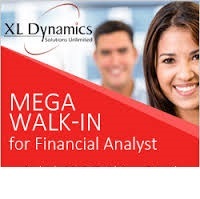 XL Dynamics Recruitment Drive For Freshers On 5th July 2016 - Mumbai. Walkin for Financial Analyst position. XL Dynamics Graduate Walkin Drive. XL Dynamics Jobs for 2013, 2014, 2015 Freshers. Freshers Walkins 2016-2017 At Mumbai. Minimum 1 year of work experience is mandatory. MBA (Finance): Freshers can also apply. MBA/PGDM (Any Specialization): Experienced candidates with minimum 1 year to maximum 15 years of experience can apply. The whole recruitment process will take entire day; candidates are therefore requested to plan out their schedule accordingly. MBA Third Semester/ Fourth Semester pursuing can apply provided they join us on immediate basis. MBA First/Second semester pursuing please do not apply. MBA last semester (results awaited/ completed) can apply. We welcome candidates from out of Mumbai. Initial relocation support in the form of travel and accommodation reimbursement is provided candidates who have been offered employment, as per the company policy. We have openings in both day and night shift. Female candidates will be considered for day shift only. Prior knowledge in mortgage is NOT required. CA (Chartered Accountants) / CS/ CFA are NOT eligible. Candidates with the existing backlogs / ATKT ( Results Pending) will not be entertained. Candidates with 45 days to 3 months notice period please do not apply. Travelling facility (Pick up & Drop) will be provided to candidates residing in western suburbs post selection as per company policy. Walkin Date: 5th July 2016. Interview Time: 10:00 AM to 11:00 AM. 0 on: "XL Dynamics Recruitment Drive For Freshers On 5th July 2016 - Mumbai."